I took these photos last week when it was really sunny, I even put the pool up... and then the sun disappeared. Sorry guys, its all my fault there is no nice weather. 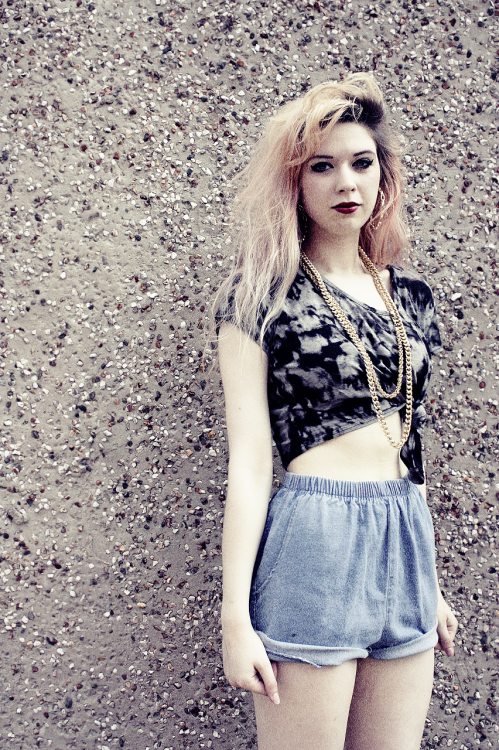 Crop top is from a car boot sale and shorts from a charity shop, although they used to be trousers but I cut the legs off. Trainers are from a car boot sale again and the chain print shirt is from a charity shop. Necklaces were given to me by my grandma and the hoop earrings are from New Look. I've finally done my roots since I took these but really badly so I think I'm going to have to do them again.. Oh and I want to dye my hair, I'm just not sure which colour..